The EHDC-101 Portable Hard Drive Case (Dark Blue) from Case Logic is designed to carry and protect a 2.5 inch hard drive. Inside, an elastic band keeps it from slipping or sliding around during transport. A slim mesh interior pocket can easily accommodate power cords or other small accessories. The semi-rigid, ribbed exterior offers rugged protection, and its compact form factor means the case can easily slip into a backpack or briefcase. 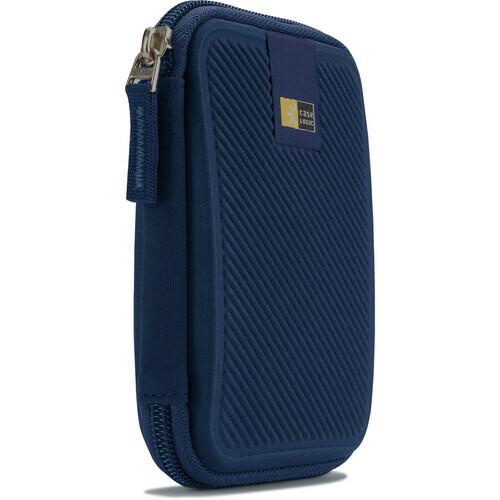 EHDC-101 Portable Hard Drive Case (Dark Blue) is rated 4.7 out of 5 by 38. Rated 5 out of 5 by slash from High quality case High quality and very good value for the money. It is a semi-hard casing made of textile and probably some plastic structure, which will firmly accommodate most portable USB hard drives. Rated 2 out of 5 by Matamux from Too thin I have 3 different types of 2.5 hdds and this case just barely manages to fit any of them on their own. And you can just forget about adding the usb cable alongside the hdd, the case just won't close. Rated 5 out of 5 by News Strategies from Affordable, basic and good protection Case Logic is a first-class brand, and you cannot beat these cases for protection of portable hard drives. I have many of them and have used the cases for years. The price is terrific. Rated 5 out of 5 by Charlie's mom from Perfect case for the G-Tech Mobile Hard I love this case! It is durable,fits the G-Drive perfectly, and has a side pocket to hold the cord(s). Rated 5 out of 5 by Charlie's mom from Portable, lightweight hd. I love the sleek design and the compact size. It's all great because it doesn't require a power cord. Rated 5 out of 5 by Ricardo from Safe Really protects your hard disks, though I'm using them for my harmonicas. Rated 5 out of 5 by Arnaldo P. from Protect more than your Hard Drive I bought this case to protect my 2T Hard Drive on an everyday basis. But I also use it to protect my portable charger from shock or scratches when I travel. Rated 5 out of 5 by tokounou from Handy, helpful and secure This case protects my hard drive on the road. The case holds it secure and room for cable as well. Does this fit the Samsung 1TB T5 Portable Solid-State Drive (Black) Samsung 1TB T5 Portable Solid-State Drive?